After multiple shu giveaways, I am now reduced to about 40+ different shus including some premium Dayi that I rarely bother to drink. I have dozens of shu samples that I haven't even bothered to brew. Why I even spent precious tea money on more shu - an aged Dayi of dubious authenticity- does not make logical sense. However like any jaded tea buyer, I just want me a little excitement and mystery now and then. 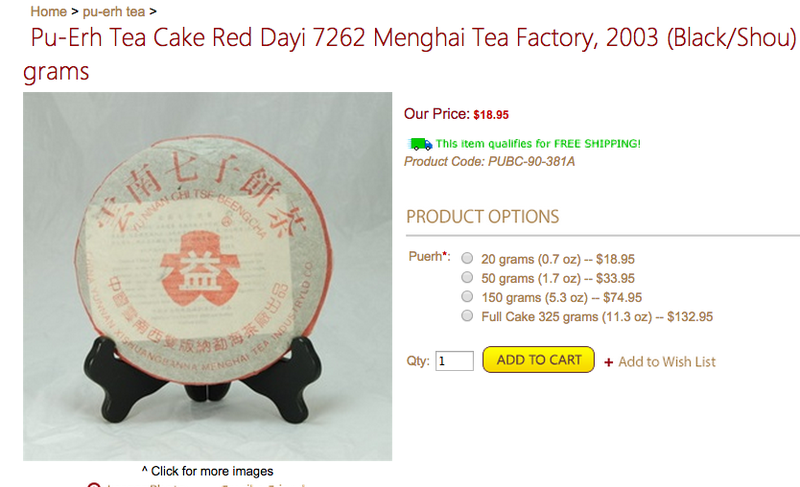 Truth be told, I'm not even a Dayi fan but I sprung $75 to satisfy my curiosity about this cake. I knew this wrapper looked suspicious because of the BEENCHA being smooshed into one word. 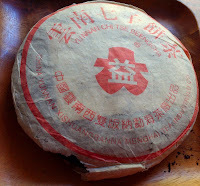 However it was the very same wrapper at Vancouver's Chinese Tea Shop that really egged on my interest. When I received this cake, I had one final chance to still back out. I knew even as I tore in that it was a fake but I still wanted to know if a tasty aged shu was masquerading behind that facade. 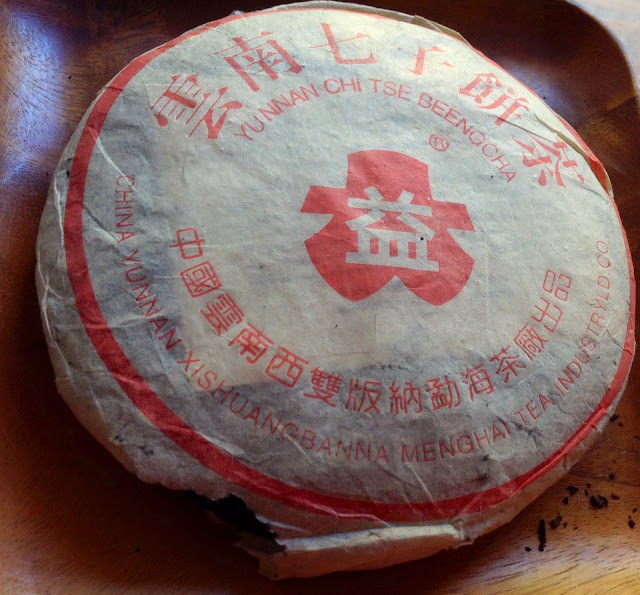 The beeng was a lumpy dirty mess- hairs, plastic strings, miscellaneous fibers; I do not think this cake is Menghai quality even at their worst. Dayi is the most faked cake in the world and this is the first one I have knowingly encountered. I'm never deterred by something so benign as hair or string so I brewed it up straight away. Judging by the number of stems present, this tea was made with grade 9 leaves or as advertised- "thick bold leaves". If it were a Dayi, it would be a 7592 or a 8592 recipe which are fine mellow recipes. However the brew has latent muddy undertones but otherwise is a shu shu- woody and earthy. Gambled and lost. I think fake Dayi stories rarely have a happy ending. I had actually bought a second cake to give to Ira just in case but the vendor let me return it right away and credited me shipping charges. Actually, the cake's not terrible and it is definitely aged over 12+ years. It's just not good for $75. What is ever going on with Daniel Lui's 7262? In corresponding with the state side vendor of my cake- he told me the difficulties of stocking puerh through middle-men in China. Among other mishaps, he's been sent a jian of tea which tastes nothing like the original sample and is fit only for compost. My middle-men in China don't always pan out for me either- reputable or otherwise but I only buy less than two cakes at a time. It's all worked in as my tuition for the year. Originally I thought I would find last month's gamble from my Hong Kong ebay vendor to be riskier- I'm actually enjoying my dodgy aged cakes more than expected even though one of them is obviously wet stored. It's also because I felt somehow satisfied with the ebay purchase that I rolled the dice once more this year. Actually I didn't even bother trying the "63" or the 2011 Douji and just gave both away. I'm conjecturing shu prices have gone up due to a lot of sheng collectors and drinkers can't drink sheng anymore and so they are forced into buying up shu. After all this, I'm feeling paying more than $30 for a shu is not worth my while and I should just hunker down with my now inflated shu collection which will probably last me two decades at my present rate.